Posted by aquillam in Astronomy, MichiganAstro. 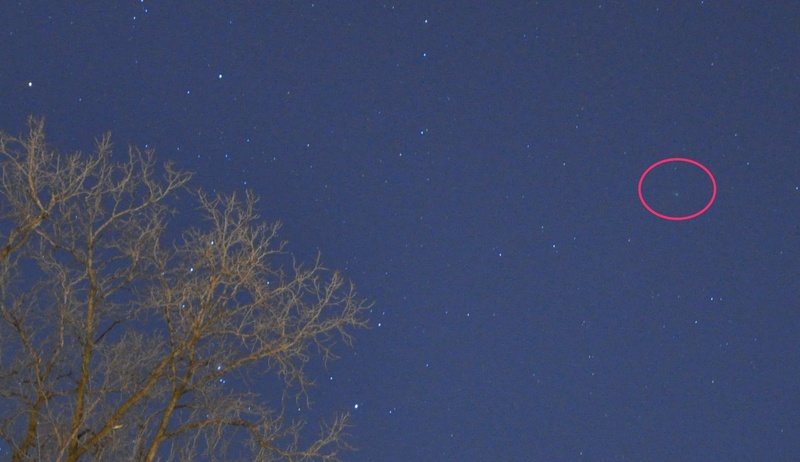 This coming week, Comet Catalina will be at its closest to Earth. Unfortunately, it’s only about a magnitude 6, so you’ll need a ‘scope if you want to see it. Also, if you’re in the southern hemisphere, you won’t be able to see it. For those up us up north, it’s skimming right along the handle of the Big Dipper, so at least it’s easy to find! Maps and more details from EarthSky. Posted by aquillam in Astronomy, MichiganAstro, Urban Observing. I’ve come to the conclusion that I will not be able to get the January Urban Observing post written. So instead, here are some hopefully timely and very short posts. Did Saturday feel warmer to you? That was the day the Earth was closest to the Sun. Of course the seasons are caused by the tilt of Earth’s axis, not its distance from the sun. The distance from the sun affects how fast the Earth moves and therefore how many days each season has. The closer to the sun, the faster the planet moves, so in the Northern Hemisphere, we have fewer days of winter than summer. The Quadrantids peaked this morning (sorry…). However, it’s active until January 10, with rates of about 25 per hour, so it’s still worth looking if it’s clear tomorrow morning. And the planet line up with a comet continues. Speaking of the comet, you’ll need binoculars or a camera for comet Catalina, but it is between Arcturus and the Big Dipper, so it should be easy to find if it’s bright enough for you skies. Here’s a map for 3 AM on January 6, 2016. Celebrating a year at the comet / Rosetta / Space Science / Our Activities / ESA. Can you believe it’s been a year since Rosetta arrived at Comet 67P/Churyumov–Gerasimenko?? Such fantastic images, and the comet is nearing perihelion now, so there’s so much going on! Guess I’d better put “update the comet lab” on my to-do list again! Comet Lovejoy, C/2014 Q2 is about 4th magnitude right now. if your observing sight is dark, it’s easily naked eye. Urban observers aren’t so lucky, but it’s bright enough to be picked by a camera! You’ll need a camera you can set the exposure and focus on (some smart phone apps will do that.) I strongly recommend a tripod since you’ll need an exposure of a few seconds. Focus first on Jupiter: it’s bright enough to see through your viewfinder, and rises by the time the sky is dark enough to see the comet. 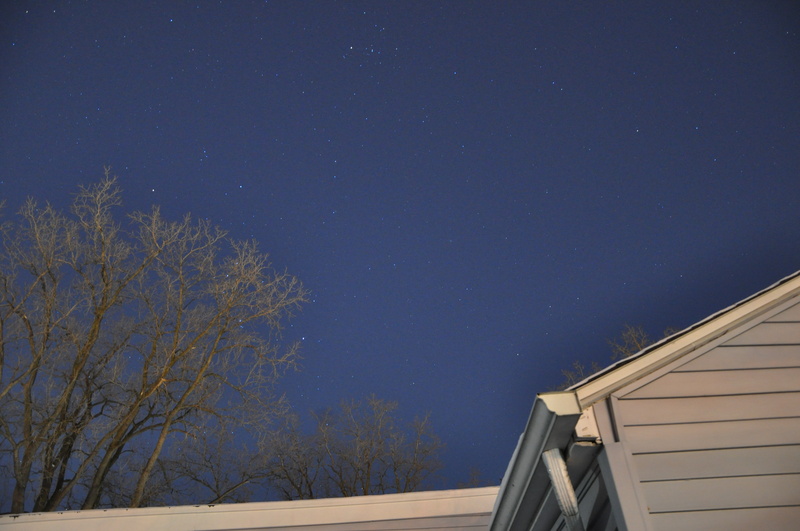 Once you’ve got a good focus, point your camera so Orion is on the left side of your view, and Taurus at the top middle. As it gets latter in the month, adjust the position so Taurus is on the left, and Orion is out of the view. Check the maps on the Sky & Telescope website for a more precise location. Take exposures ranging from about half a second to about 15 seconds – the longer your exposure, the better the comet will look, but too long and the sky brightness may wash out everything. You should have a very wide field image. Once back inside, you can zoom in and crop to get a better composed picture. Of course, if your skies are this bad, adding a little guidance might help. Ok, you’re unimpressed. I can tell. But consider how bright those trees are. And, it was so cold my camera stopped working. Hey, if you think you can do better, prove it! Share your photos!